Teachers are most commonly revered and idolized by their pupils or students especially by the role they play while they teach. For what they are, they produce the kind of pupils of what they exemplify or practice in their life. They teach what they are. Their true character is reflected on the manner they teach their pupils. Cubay Elementary School, my humble school in the Division of La Carlota City celebrates this day in her own unique way through the concerted efforts of the pupils, the parents, and some external stakeholders of the school. And 'teachers teach what they are' is the basis of my short message. 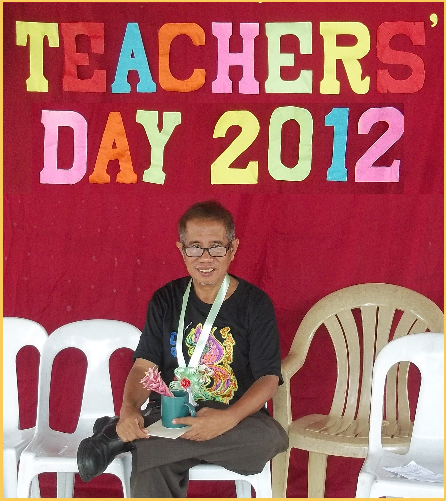 Teachers' Day is a special day for every teacher. It is a time dedicated to the teachers that they may be recognized for their invaluable teaching efforts, for their outstanding achievements, for their heroic deeds in molding their pupils as a better, responsive and gainful persons someday. "Teachers, you are what you teach." This is what I emphasized in my talk before my 13 teachers with the presence of some parents of the pupils and PTA officers in our simple, but momentous teachers' day celebration this morning in Cubay Elementary School. This phrase reveals the truth what my elementary grade teachers had greatly influenced me and molded me the way what I am today. Children generally follow the attitude of their teachers. 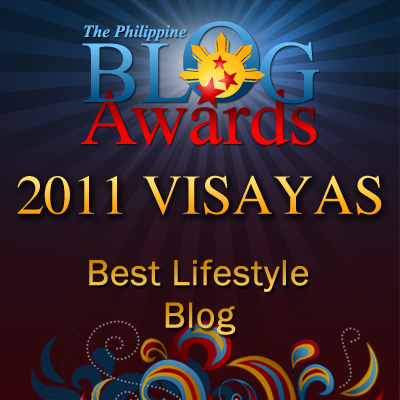 They are the best imitators so to speak. 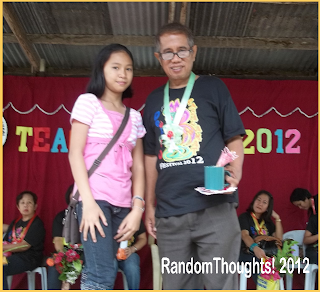 They've regarded their teachers as persons in authority and follow their examples rather than their parents. I expounded my short message in the premise of the acronym "teach". Teaching is a noble profession. It is the great privilege and even an authority to make or unmake a person the way the teacher teaches. Teachers generally urge their pupils to be a professional like them. Education begets effective teaching. Thus, the quality of teaching the teachers impart to their pupils are dependent on the education they acquired. Quality teachers produce quality pupils. And quality pupils benefit from quality education. Attitude reflects the kind of a teacher teaches. Caring, loving and diligent teacher do produce caring, loving and diligent pupils too because of their example. Teachers live what they teach. Character is the most important factor in teaching. It is not the lessons the teachers teach. But rather, it is how the pupils' behavior have been influenced, changed and improved for the better. Teaching is character building. Home is the best place where a child is best taught in character building and the school strengthens it. Generally the first education starts at home and the mother is the first teacher of the child. The simple, momentous teachers' day of our school is enlivened by a thoughtful pupils from Kindergarten down to grade six level by entertaining their teachers with their folk and modern dancing. 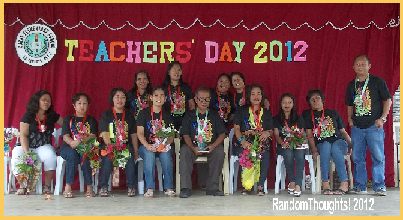 They also recognized the efforts of their teachers teaching them by giving some flowers, mementos, and greeting cards. They let their pupils feel how thankful and grateful they are by giving them a kiss sweet and a warm hug. I was not spared by these thoughtful gestures of our pupils. Some pupils especially the grade 5 and grade 6 gave me cards of thanks, a flower. While our PTA president, Mrs. Racquel D. Angelitud through her son, Justin gave me a blue green mug recognizing my authority and leadership in the way I handle and manage the whole school of Cubay Elem. School.And Lou Jynny B. Bustillo, grade 6 pupil of Miss Gemma Salazar handed me a yellow green garland as a token of respect and gratefulness as her school principal.